The largest moon in our solar system, a companion to Jupiter named Ganymede, might have ice and oceans stacked up in several layers like a club sandwich, according to new NASA-funded research that models the moon’s makeup. Previously, the moon was thought to harbor a thick ocean sandwiched between just two layers of ice, one on top and one on bottom. “Ganymede’s ocean might be organized like a Dagwood sandwich,” said Steve Vance of NASA’s Jet Propulsion Laboratory in Pasadena, Calif., explaining the moon’s resemblance to the Blondie cartoon character’s multi-tiered sandwiches. The study, led by Vance, provides new theoretical evidence for the team’s “club sandwich” model, first proposed last year. The research appears in the journal Planetary and Space Science. The results support the idea that primitive life might have possibly arisen on the icy moon. Scientists say that places where water and rock interact are important for the development of life; for example, it’s possible life began on Earth in bubbling vents on our sea floor. Prior to the new study, Ganymede’s rocky sea bottom was thought to be coated with ice, not liquid — a problem for the emergence of life. The club sandwich findings suggest otherwise: the first layer on top of the rocky core might be salty water. This artist’s concept of Jupiter’s moon Ganymede, the largest moon in the solar system, illustrates the club sandwich model of its interior oceans. Image Credit: NASA/JPL-Caltech. 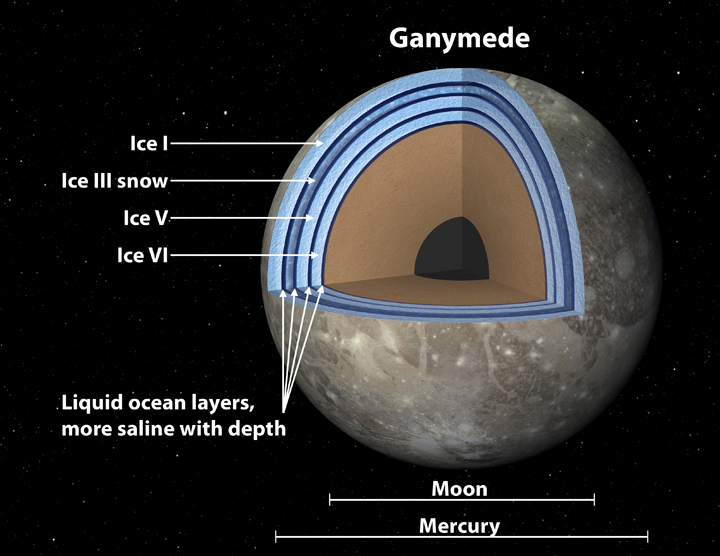 This entry was posted in Science News and tagged Ganymede, ice, Jupiter, NASA, ocean on 2014-05-02 by Heather Dalton.